It's not a small problem, experts say. NOAA has a longstanding program to free entangled humpbacks in the Hawaiian Islands Humpback Whale National Marine Sanctuary as well as in other waters where the animals live. In its new partnership with the nonprofit, Oceans Unmanned of Santa Barbara, California, the agency will use video camera-equipped quadcopters to make the program more effective and safer for the animals and the humans trying to save them. Given their desperate situation, it’s not hard to imagine how entangled whales can jeopardize the safety of rescue crews, who use small boats to get close enough to the animals to cut away the debris using bladed poles. Last year, NOAA temporarily suspended its response efforts after a right whale struck and killed a rescuer. 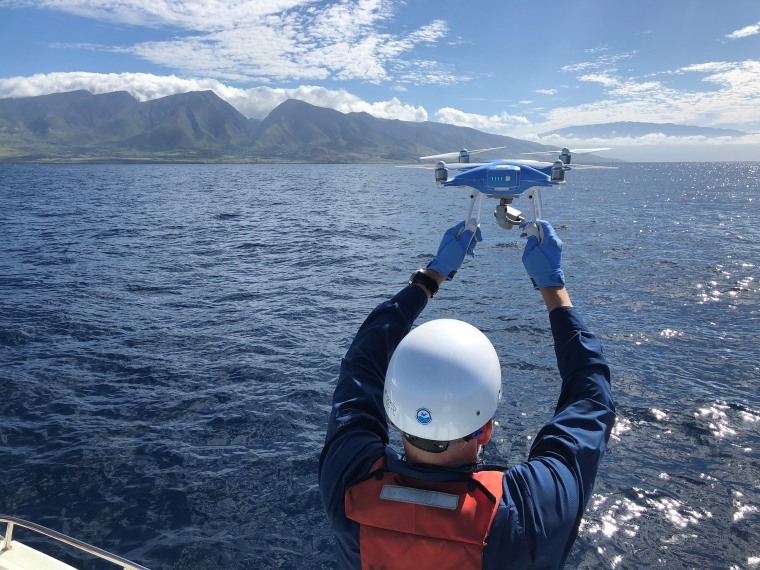 Under the new initiative, known as the freeFLY drone program, remote-control drones will fly over entangled whales, beaming live video of each animal and the precise nature of the entanglement to crews aboard rescue boats. Using this information, the crews should be able to plan exactly how and where to make the necessary cuts before they move alongside distressed whales. Pickett said his group and NOAA are now “gearing up” and hope to implement the program this fall, when humpbacks begin their annual migration to Hawaii from Alaskan waters. If all goes well, he said, the program will expand to Alaska and the West Coast of the U.S. by next year. Whale-friendly innovations in fishing technology, including fishing gear made with weaker material, might help. One recent study showed that gear made with ropes weak enough for large whales to break could reduce entanglements by 70 percent.